Pandorea, are vigorous evergreen climbing and twining plants best known as ‘Bower of Beauty’ or ‘Wonga Wonga Vine’. Found from Northern QLD through to Southern Victoria the species include Pandorea jasminoides ‘Bower of beauty’. Pandorea pandorana ‘Golden Showers’ has smaller yellow trumpet shaped flowers, very colourful with good dense foliage. Both readily available for sale from both online and retail nurseries. ‘Snow Bells’ is a white flowering cultivar as is Pandorea jasminoides alba ‘Lady Di’. With increased awareness many new cultivars are coming onto the market, generally larger flowers and purer colours. 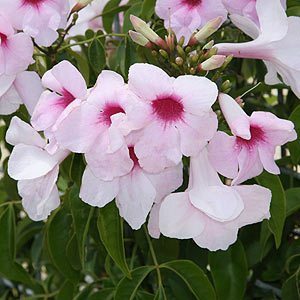 A sunny position free from frost in a well drained humus rich soil is best for these free flowering climbers. Characterised by long yellow or white trumpet shaped flowers they are a hardy vine once established. Prune lightly to keep in shape. P.jasmanoides (see picture right) has attractive white flowers, some cultivars with more of a a pink throat than others, a very attractive climber also a variegated form, Pandorea jasminoides ‘Variegata’ .